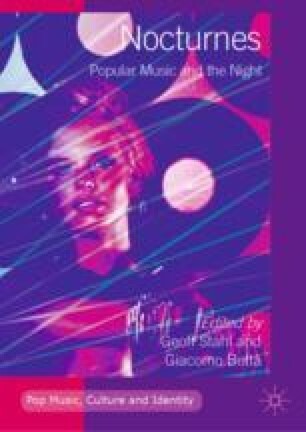 This Afterword locates the study of music and the night in relation to several new developments in cultural analysis. One of these is the emergence of “night studies” as an interdisciplinary enterprise devoted to examining the night in its social, economic, cultural and environmental dimensions. Another is what I call the “urbanization” of popular music studies—their increasing concern with music’s place within the politics of proximity characteristic of the contemporary city. These developments have provided a rich context in which music’s relationship to the night may be understood. Colaboratorio. 2014. Manifesto da noite/Night Manifesto. Sao Paulo, Brazil: Colaboratorio. http://colaboratorio.art.br/downloads/manifesto_da_noite.pdf. Taneja, Richa. 2017. #IWillGoOut: Women in 30 Towns and Cities Demand Safe Public Space, January 23. New Delhi, India: NOTV.com. https://everylifecounts.ndtv.com/iwillgoout-women-in-30-towns-and-cities-demand-safe-public-space-9385. Accessed 27 June 2018.